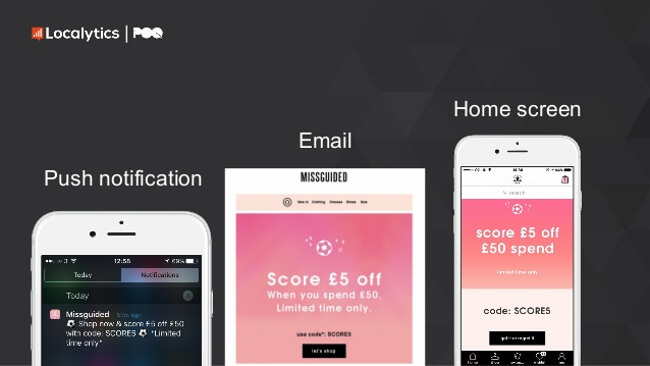 In-app & web notifications were created to help digital teams meet important marketing needs such as onboarding new visitors, cross-promoting other websites, influencing how visitors navigate a website or mobile-app, informing visitors of special offers / sales or even updating them regarding new content available on the site. They’re also very easy-to-use in the sense that you have full control of the content and appearance of the notification. For example, with most of the tools below you can personalise your notification(s) to fit your brand’s look-and-feel and blend it with your website or mobile app seamlessly. With these notifications, it is also very easy to author a message. A lot of times the message is very straightforward and doesn’t require any sort of coding update. Read on for our definitive list of the top 10 tools with in-app & web notifications. Try out these solutions, and watch your engagement go through the roof! Mopinion is a feedback analytics tool that also offers possibilities for in-app and web notifications. Users can create messages (including a description, e.g. a special offer, and a Call-To-Action or CTA) in either modal overlay or slide-in forms – both of which can be customised with a branded look-and-feel. Once a notification has been created, users can target particular user segments and apply triggers such as exit intent, time on page, scroll percentage and more. All incoming data from notifications such as clicks, views, and more can be analysed in Mopinion’s intuitive feedback dashboards (along with other critical feedback data). Note: in-app notifications can be setup using Mopinion’s SDK. PushWoosh is a well-known user engagement platform that automates in-app and web notifications. The tool offers possibilities for A/B testing, Analytics, Campaign Segmentation and . It also has a feature called Geozones which are essentially pins on the map which when visited by your customers, send push notifications to them. RSS Feeds and Twitter Feeds can be linked to the tool as well (enabling users to receive push notifications based on content shared). Swrve is a marketing engagement platform that has a number of different tools built-in, including personalisation tools, targeting & segmentation, A/B testing, analytics & reporting and of course, engagement tools. In terms of engagement, Swrve offers push notifications, in-app messaging, email/web/SMS and campaign templates. All push notifications are configurable with customer sounds and action categories as well. Countly is an analytics platform which is used to track customer journeys in web, desktop and mobile applications. Essentially what this tool does is gather customer-related data from devices and shows this to users in a more digestible format – a real-time & user-friendly dashboard. It also includes in-app and web notifications which can be sent out with interactive media (such as image, audio and video) to all or a targeted group of customers (based on actions or location). 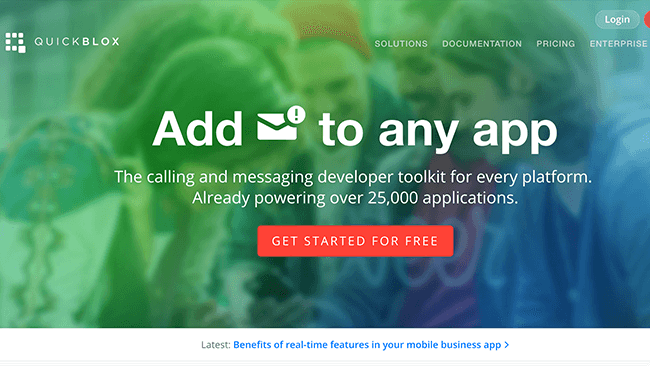 Quickblox is a calling and messaging developer toolkit that works on any platform. Users can set up automated news messages & updates, make use of video calling, instant messaging, push notifications or even just use the system as a database. Localytics is a mobile engagement platform which offers in-app, email and remarketing campaign tools. It also offers in-app and web notifications through its push notification feature. 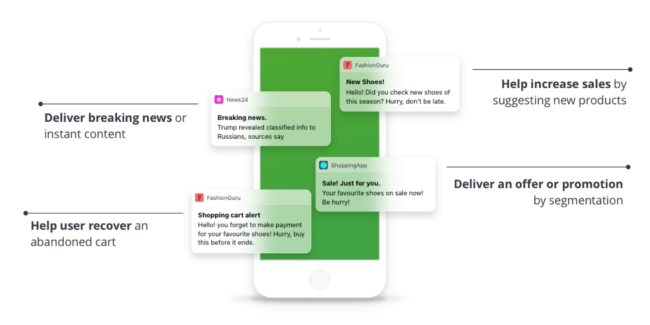 Notifications can be used to showcase content, drive revenue (through targeted offers), update users on breaking news or an order status, engaging users who haven’t opened the app in a while and more. Users can choose to use rich push notifications which include images, videos, GIFs and audio on both iOS and Android. Kahuna is an automation platform which offers personalised messaging via various channels, such as email, app & browser push notifications, in-app & web messaging and SMS. This tool takes your customer profile data and applies cross-channel messaging and artificial intelligence to send out these personalised messages. What’s nice about Kahuna is that it also offers analytics dashboards for reviewing behaviour trends. PushBots allows users to send messages to any web or mobile platform straight from the user dashboard. Push notifications can be scheduled so that they are sent later on. 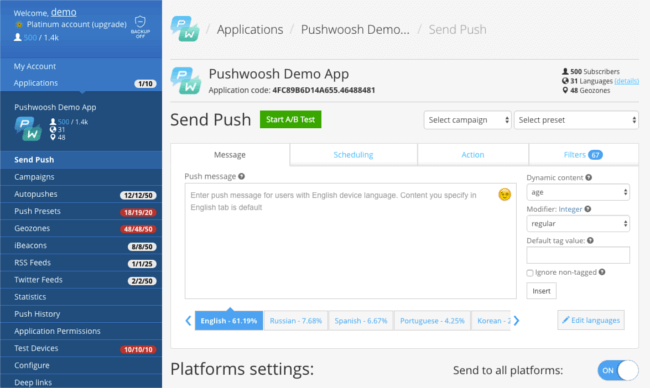 Users also have the option to use PushBot’s push APIs for a seamless integration (in the language the user chooses). All push insights can be tracked in the tools analytics dashboard which includes real-time charts and user analysis charts. Note: this tool is also available as a WordPress plugin. OneSignal is a multi-platform Push Notification service which supports web and native. This tool includes real-time tracking along with A/B Testing (by sending different messages to different users). OneSignal also offers custom post-types that can incorporate photos and videos that can be sent out on a schedule the user creates. Mixpanel really focuses on the user interactions with both website and mobile applications. This tool provides targeted communication with visitors (including e-mails and push notifications), in-app A/B tests and user survey forms. Additionally, you can visualise the data collected in less than 10 minutes. The push notifications are customisable – with options to choose when and under which conditions a user will receive a notification from your app. If you haven’t noticed many of these tools focus mainly on providing push notifications, which often means that visitors must provide an opt-in to receive these notifications. However, tools that offer simple web or in-app notifications, such as Mopinion, are always be visible. These operate similarly to a feedback form which can be triggered based on user behaviour. It’s also important to recognise that while in-app and web notifications are great for communicating promotions and other important announcements, they remain a one-way street. If you want to engage in a dialogue with your customers, you might also want to consider a customer feedback software. 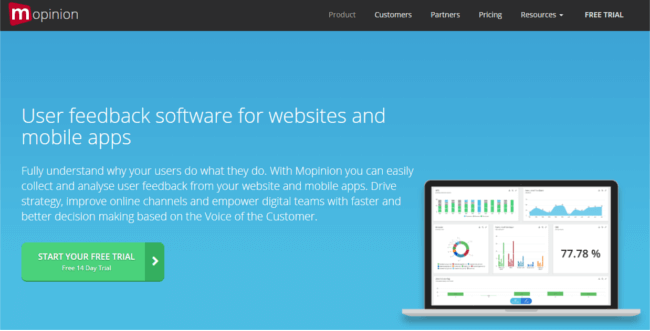 Mopinion offers all-in-one with customisable feedback forms that can be used for both feedback purposes as well as for notifications.